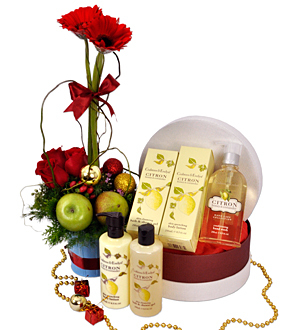 A pampering selection of Crabtree & Evelyn Citron Body Wash 250ml, Body Lotion 250ml and Citron Body Hand Wash 250ml. Comes with an enthralling topiary of Roses, Gerberas and fresh apples. This gift arrives gift-wrapped, with fresh bouquet for delivery within Klang Valley. For outstation delivery, fresh flowers will be replaced by artificial flowers and at least 3 working days notice required. Crabtree & Evelyn's range of toiletries' is subject to availability and may be replaced with Crabtree's other similar valued pairs. Contact our Customer Service at 012-6915200 / 03-78830233 for further details.